In this spacious apartment you will feel at home. The bedroom is at the back, so you can sleep in peace. Through a long corridor, you pass the modern bathroom and into the huge living room. Here you can relax on the stylish couch furniture. From the living room you have access to the kitchen and the beautiful balcony from which you can enjoy the green inner courtyard. 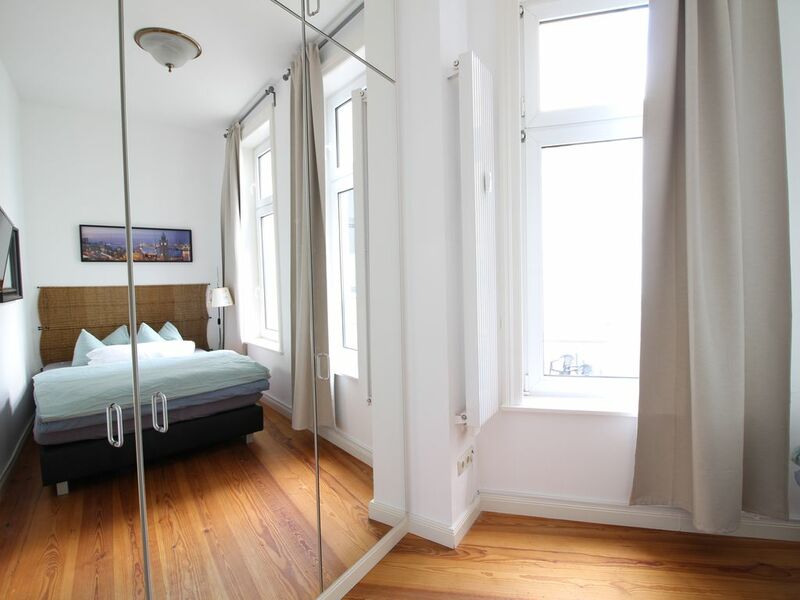 The apartment is equipped with everything you need for a wonderful stay in Hamburg. Very homely. Facilities first rate. The whole experience in Hamburg was great. Dirk was a great host who was in constant contact about arrival & helped with luggage when we arrived. We came with too much luggage and were grateful that we were on the first floor. Both of us have been sick and Dirk has gone out of his way to help. Location is excellent. Wir hatten gleich zwei Wohnungen im Haus gebucht. Beide Wohnungen waren Top eingerichtet und mit allem was man braucht ausgestattet. Sehr unkomplizierter und netter Vermieter. Wenn noch einmal Hamburg auf dem Plan steht, werden wir sicher wieder hier buchen.